The 3rd Generation of Contour Leg Pillows that keeps you cooler!. This leg pillow features a supportive inner core, similar to that of the Original Contour Leg Pillow, with a gel-infused memory foam outer layer for the ultimate in comfort and support. The new Cool Leg Pillow is constructed of 2 different layers of foam for better support and comfort. 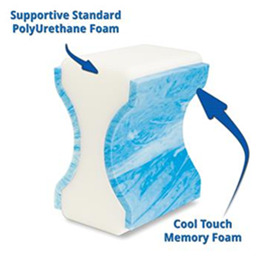 The inner core is support foam to hold its shape to help provide stable support while the outer layer is a gel infused memory foam which stays cooler and won't heat up like traditional memory foam. Includes a premium zipperred cover. This pillow provides the support our users need and yet allows you to stay cool through the night. Covering the foam core is a premium With the specially designed outer core, the pillow stays cooler, keeping you comfortable through the night. Package Dimensions: 9.5" x 6" x 12"